This was taken in a park I discovered today in my town, this particular tree only blossoms for 10 days a year so I was very lucky to get these shots. PP. Very little, convert from raw boosting contrast, vibrancy and reducing colour temperature (in honour of the challenge), neat image, crop, sharpen, frame, save for web. AAAAAAAAH!!! Wow, this is unbelievable, I am so pumped right now! This is the first thing I've ever won photography wise, I'm so happy that the effort I've put in over the last few months has come to something in the end. Thanks to all you wonderfully generous voters and to everyone who has helped me improve to beyond what I thought possible. This shot is for my Uncle Mick. p.s Just noticed this is the first shot to ribbon with my lens and the second with my camera! I think this border is fitting to the image. Must be the matching flower's white tones. Congratulations on your yellow. This is such a pretty shot, the ribbon was well earned! Nice work Jimi! Big congrats on a fantastic image and your first ribbon!! Fantastic capture! Congrats on the third place! Oh yeahhh!!!!! Being the big fan of bees that I am. . .I think this one most DEFINITELY deserves top honors with a ribbon :) Those fast, crazy-flight-patterned fellows are hard to catch in flight, aren't they! CONGRATULATIONS! Congrats, Jimi- you deserve this ! This is one stunning photo - congrats on your first ribbon; I am quite sure there will be more to come. Dude this shot rocks!! Well done, congrats on your first Ribb. Happy for you James. Hope to see more cool shots in the future. Congrats on your new PB and first ribbon, excellent shot! An excellent photograph - many congratulations on your first ribbon and I'm sure there will be more. Congrats on your new personal best & that lovely yellow ribbon! Well done. Nice capture! Perfect depth of field. 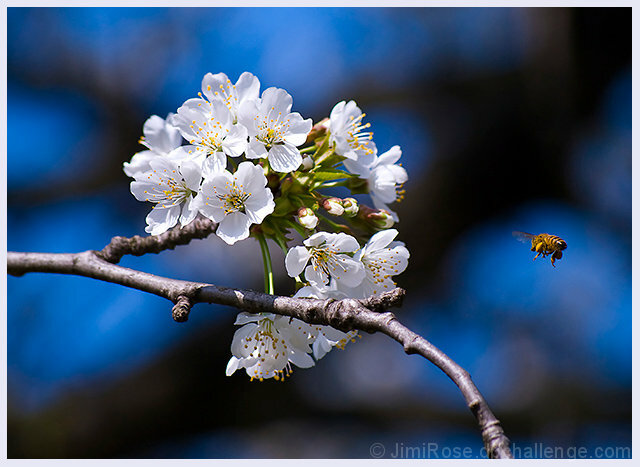 The fact that the bee AND the flower are in focus and the rest not is amazing... Love this one and hope it does well. LOL, the bee completes the picture and at the same time making it funny, good job. I like it really a lot, great focus. Wish the major elements were a little more blue/green to more closely match the challege. Very nice colors and a pleasing shot overall. Back to bump you up to 8. I love Bradford Pear blossoms!!!!! Nice bee stop action. Proudly hosted by Sargasso Networks. Current Server Time: 04/19/2019 01:13:04 PM EDT.